This is a new 'Seasonal Sweets' column written and photographed by me over at Serious Eats. I am happy to be on board as a writer for the fine folks at Serious Eats. I hold them in high regard. Their delicious food postings are always well researched and superbly written. I hope you enjoy this simple yet decadent, classic French dessert I infused with some, no surprise, Indian cardamon. I confess I made this clafoutis just in time for Rosh HaShanah and went directly for dessert before dinner, not once but twice. I wish you could see IRL (in real life) the pudding-like consistency and how during the baking process the plum's skin bled fuscia red into the yellow flesh. This clafoutis version has subdued intricate textures and colors and a sensational flavor. I baked it within a week four times for different holiday parties and entertaining at home. Super easy to whip together in literally moments time. In the 'Joy of Cooking', circa 1997, clafoutis is described as a “a simple French country dessert, similar to an old American dessert called Batter Pudding.” Joy of Cooking further sites that “according to Larousse Gastronomique, the Academie Francaise defined the clafoutis as a “sort of fruit flan.” Under protests from residents of Limousine, the definition was changed to a “cake with black cherries.” I gather Joy of Cooking is referencing the earlier French Larousse Gastronomique edition. 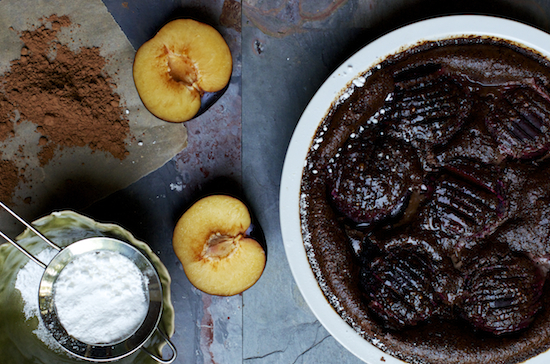 Traditionally, a classic clafoutis is baked with un-pitted whole cherries. The pits are said to add a flavor similar to almonds to the flan-like baked custard. In Middle Eastern, Greek and other nearby countries' cuisines, the seeds inside the St. Lucie's cherry stones are ground and the ground seed spice is called Mahlab. The Mahlab is then added to Greek and Middle Eastern baked goods and desserts to achieve the same almond-like flavor desired in the traditional French clafoutis. The Mahlab is also added on some occasions to certain savory dishes. 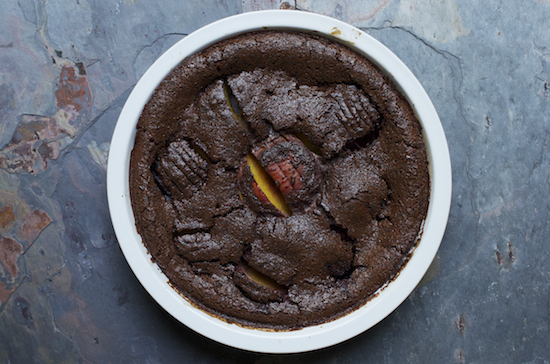 Cherry season has come and gone but often clafoutis is baked with other stone fruit, berries or seasonal fruit and referred to as Flangnarde or Flongnarde. The term clafoutis is reserved exclusively to the dish made with cherries. There are a couple beliefs on the etymology of clafoutis. Clafoutis is believed to be derived from the old French word claufir which means attach with nails. The other belief is that clafoutis is derived from the Occitan word clafir which means to fill. When baking clafoutis in the past, at times I used Julia Child's two step baking method and recipe from her classic 'Mastering the Art of French Cooking'. Pour part of the batter first, bake for approximately ten minutes, then add the fruit and pour the remainder of the batter over it and continue baking for an additional 45 minutes. While I understand the logic behind the two step baking technique, it is not a necessity but a good option if you wish to experiment with a different method in the future. 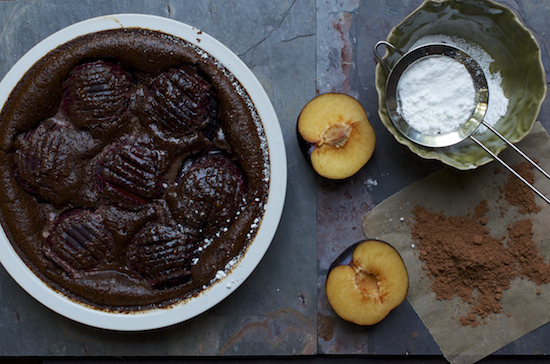 The Chocolate Cardamon Plums Clafoutis recipe here is a whisked together quickly and no fuss dessert. 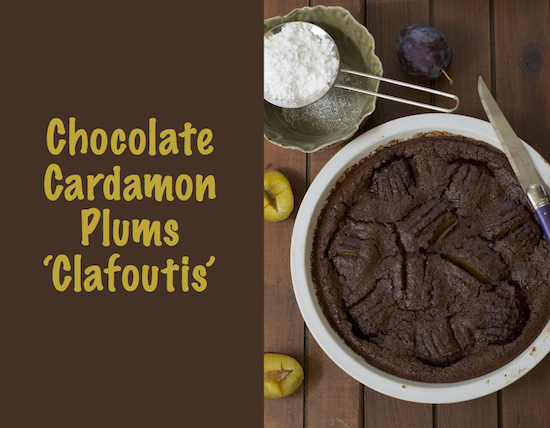 I paired cardamon and chocolate with the plums here, but chocolate and cardamon will pair beautifully with cherries when they are back in season. It also pairs beautifully with peaches that are so succulent right now at the market and with figs and pears as they are starting to show up for the Fall season. The batter will sink somewhat when coming out of the oven. Dust it with confectioners sugar and serve warm. We even like it cold. We should be so lucky it lasts and not devoured on the spot. Preheat oven to 350F. Butter a 10 inch pie dish or a cast iron skillet. Line the bottom of the pie dish or cast iron skillet with the plums flesh side down and set aside. I line each sliced half plum slightly fanned so the custard sips in between the sliced fruit. You can process all the ingredients, except the plums, butter and confectioners sugar, in a food processor just until incorporated. Do not over mix the thin batter. Pour the batter over the plums. Bake for approximately 45 minutes - 1 hour**. Test with a wooden skewer. If it comes out clean, the clafoutis is ready. Dust with confectioners sugar a few minutes after it comes out of the oven and serve. If dusting immediately after when the clafoutis is super hot, the confectioners sugar will melt on the top and be grainy. Alternatively, whisk the eggs in a large bowl and beat for a few seconds, add the milk, vanilla, sugar and cardamon and whisk together. Add the flour and cocoa powder and mix until just incorporate. Do not over mix the thin batter. Pour the batter over the plums and bake for 45 minutes - 1hour**. Test with a wooden skewer and dust with confectioners sugar as directed above. You can bake individual clafoutis servings in 6-8 small ramekins. Adjust baking time accordingly. *1/2 a cup sugar will be lightly sweetened dessert. **Ovens vary. It took the clafoutis to bake in my oven about 47 minutes. ***Use ripe but firm fruit so it won't release too much water. The more ripe the fruit is the longer it will take to bake. I've never had a clafouti with chocolate before. I'm dying to try it. Aww Maureen so lovely hearing you had a first hand experience with the original version. Thanks for sharing your story. A delightful clafoutis! I have never tried this flavor combination... I'm addicted to plums! TY Rosa, I can't believe I baked this 4 times within a week. Everything in this recipe sounds delicious, it's chocolate, what's not to love here. Gorgeous, I love the sound of chocolate with plums! TY Laura. I know, right?! Oh, how wonderfully decadent Shulie! Terrific write-up. TY Viviane. Mean the world coming from you. TY Liz. I think the plum skin & the cocoa gave it that hue. Gladly! Lovely presentation and writing here Shulie. Congratulations on the Serious Eats partnership! 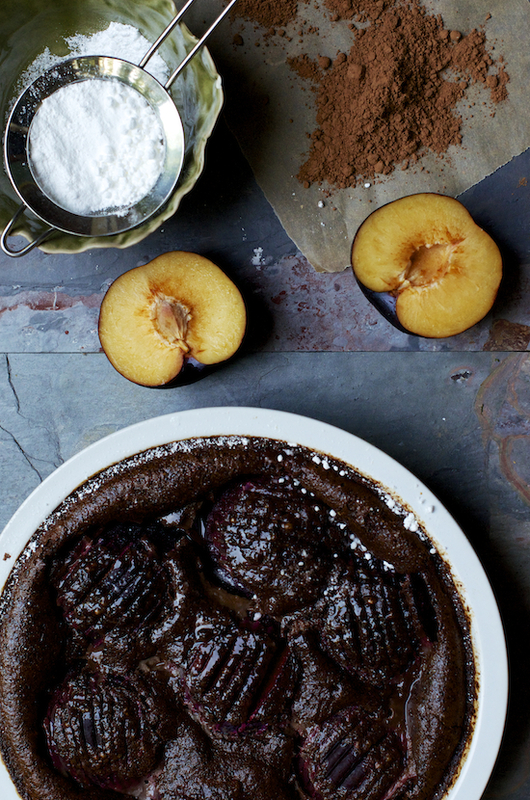 3 of the best words together: Chocolate Cardamon Plums. OH MY GOODNESS! YES! Congrats on the new Seasonal Sweets column with Serious Eats! They are fortunate to have you as you are a wonderful food writer. :) But...wowl! I am just blown away by this 'Clafoutis', Shulie! How something so beautiful can be put together so easily fascinates me with baking. I enjoyed reading this post and how you described the bright colors and contrasts as well as all that fabulous info about cherry pits providing almond flavor. I adore cherries (as if you didn't know by all of my tart cherry posts, LOL) and always learn something new from you! 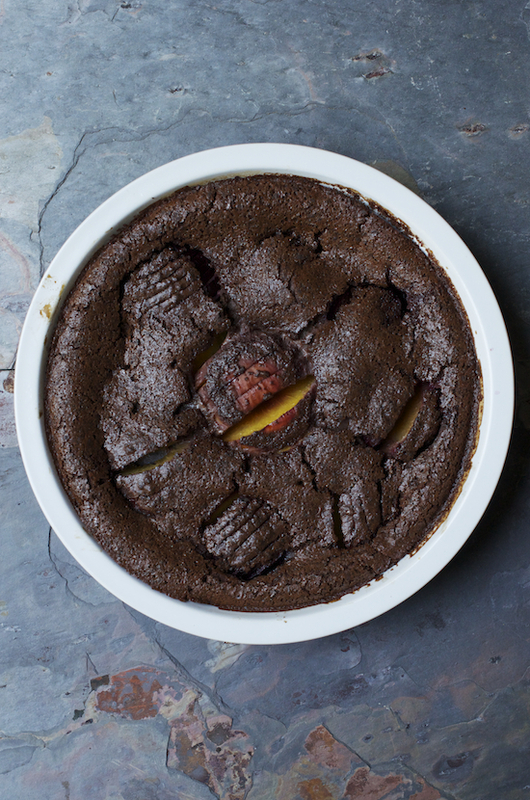 Love that you incorporated cocoa for a chocolate version of 'Clafoutis'. 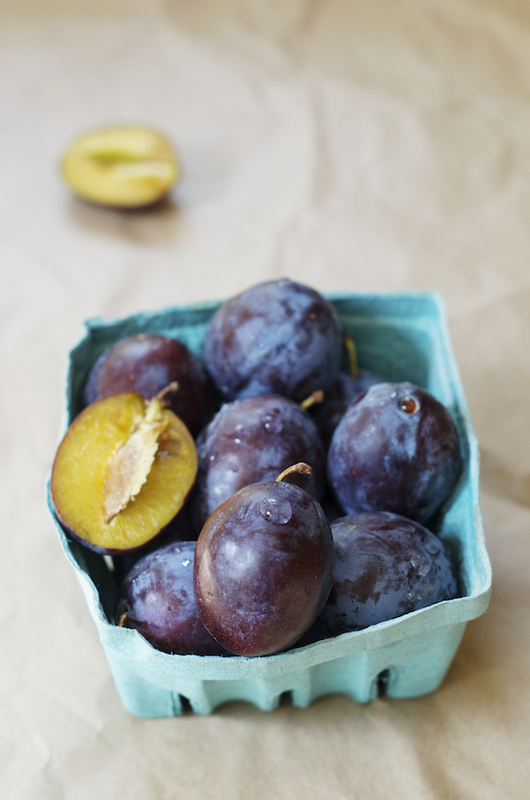 Cannot wait to make your recipe with cherries, but am fond of your brilliant 'other stone fruit idea', with plums! Thank you for sharing! What an intoxicating clafoutis! 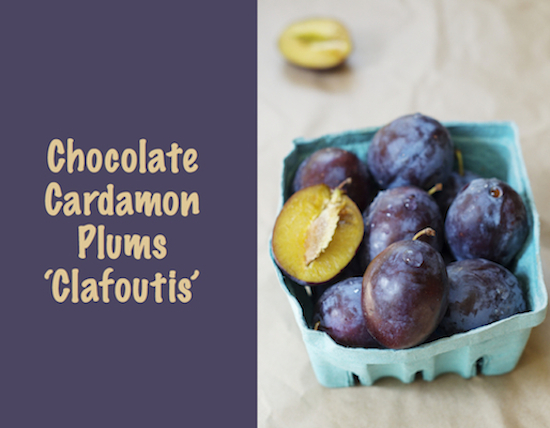 Choclate and caradamon paired with plums is such a glorious marriage of flavors! I find it to be a mix between flan and bread pudding in texture. But never mind the definition, this is a marvelous recipe Shulie! 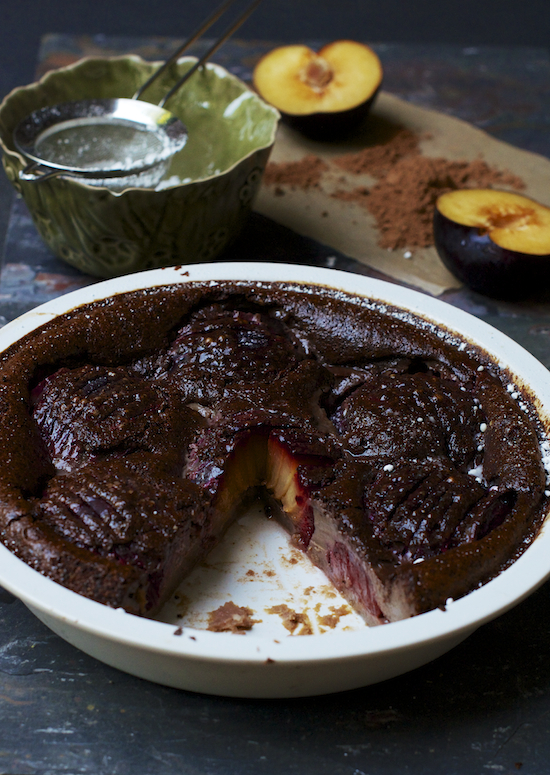 I've been meaning to use cherries in a chocolate clafoutis, but never imagined it with plums. Brilliant! I love clafoutis and this one looks awesome! I don't care how you make it, i just want to eat it! This made me sad as we just cut down our two plum trees. They were on their last legs but now I miss them. Gorgeous clafouti, Shulie! And lucky you. I have always been a big fan of Serious Eats! It was so lovely to meet you this weekend! This looks absolutely fabulous. My plum tree didn't produce much this year, but that means next year will be gang busters. Now I'll have something to do with them! Oh! This looks so good! I JUST bought a whole bunch of plums, but most of them went bad. I should have seen this earlier!! One of my very favorite desserts, I love your chocolate version! Congrats on your partnership with Serious Eats, Shulie. How wonderful! Love the colors and flavors in this dessert!